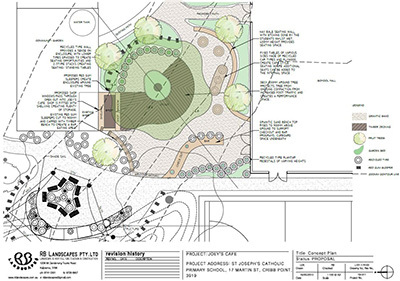 After the success of their outdoor kitchen classroom, wetland and mangrove research centre, St Joseph’s Primary School in Cribb Point contacted the RB Landscapes team to design Joey’s café, in a neglected area under an existing River Red Gum where students could sell their produce grown in the veggie patch and serve food they cooked in the outdoor kitchen. 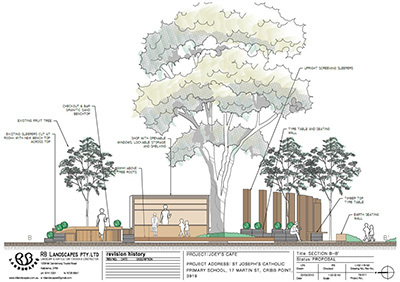 Collaborating with students in a design workshop, Richard Bellemo and the RB Landscape Architects, put together a design concept for Joey’s Café. The design links the café to the outdoor kitchen by using the same material pallet and design style. 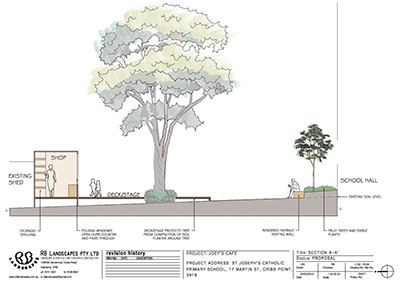 Joey’s café is centred around the existing tree with a deck proposed to reduce the compaction and traffic effects of Joey’s café on the tree. A small shed opens to become a shop where food and produce can be sold. The area is enclosed by a rendered hay bale wall and series of tables where visitors and students alike can enjoy the shade and atmosphere of Joey’s Café.